The State Literary Award and (Literally) the State of the Award. As usual, the “State Literary Award” has had a shroud-like call; a ghost-like run up; an abrupt delivery, but with trumpets, pomp and pageantry; and a stroke on our brains to carry us through the remainder of the year. 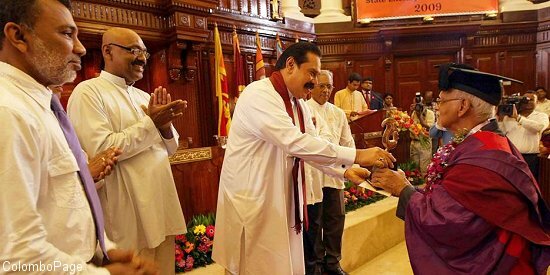 The “State Literary Award” is often upheld for it is where the cup is received from the President’s hand; is a trilingual appreciation of literature and is “a state felicitation” nonetheless.Then, on the other hand, these are the very reasons why the prizes given should have greater credibility and weight. But, sadly, and not too surprisingly this has not often been the case; and then we add to it 2010. I received an e.mail on one of my unhacked accounts showing a beaming Thisuri Wanniarachchi holding aloft a trophy for the “best novel” of the year (2009) at the said “State Literary Awards”. The work for which she has been adjudged the “best novelist” is her maiden Colombo Streets: a novel which, by all means, was fairly below average. Now, bear with my judgment, even though it may be of suspect – for I, myself, have been often deemed as being unable to write a decent piece. But, where Colombo Streets is concerned, I felt it was an amateurish effort of an emerging writer out of high school – no more. My efforts of trying to read the work proved not much fruit either. 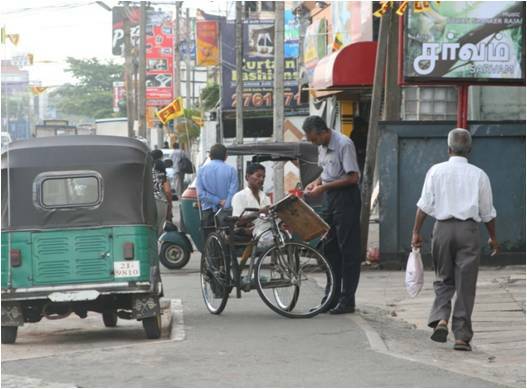 One of Colombo Streets’ early critics was the blogger “egghead”, in his/her blog ‘Sri Lankan Books’. S/he basically tore apart Thisuri’s effort raising, to begin with, questions of Thisuri’s very legitimacy as a writer. I was actually reserved and reticent in my comments; nor did I attempt a review of the book: simply letting Thisuri be, after the “egghead” onslaught. But, I remember how there were several ‘bloggers-in’ who went to extremes in defending Thisuri Wanniarachchi and Colombo Streets. Hiding behind dubious ‘blogger names’ they tried to build up a case – a case which, in itself, I felt was futile – for the writer. Among the apologists who could be identified were a campus don and Prof Neluka Silva of Colombo University. Reading through the debate that had developed I remember baffling myself as to what Thisuri Wanniarachchi’s connection with Prof. Silva was. This was for no other reason than my having met the professor on several occasions; and as I now found her championing a major defense on behalf of a late teen Thisuri writing. But, that was it and I soon got back to other concerns of the world. I didn’t hear anything of Colombo Streets until this – the “State Literary Award”. I was both amused and shocked by this pronunciation – for what it implies is that Sri Lanka has not produced a novel worthier than this average text for the year 2009? I seriously have no idea as to what other books were considered for this prize; and as to whether the prize holds much hype and interest. But, surely, there has to be a quality in the awarding of a prize of this nature; carrying the credentials it magnificently promises it carries. When I shared this news – that Colombo Streets has won the prize in question – with a fellow critic, he jokingly observed that the Gratiaen being won by Mythil’s Secret (by Prashani Rambukwella: what some felt was another controversial decision earlier on this year) and now an amateurish novel by a late teen winning the State Prize proves that it is surely the “Children’s Year”. Not the caustic sense of the cynic you expect on this jubilant occasion – but, I hope you see the point. One shouldn’t forget that 2009 was also the year of the likes of Chucking the Dragon (Mark Wilde’s novel) and the retrospective The Whirlwind (by A. Santhan). The evening’s programme, I am told, dished out a solid 39 literature-oriented prizes. But, surely, these prizes have a good sheen of transparency and credibility to gain. Not only in the awards, per se but, also in the extension for a wider participation and in actually being more public in and more committed to the promotion of the prize as a potent forum of national literature; rather than a freak hide and seek game beefing out queer heroines. I agree with you completely, Vihanga. I picked up the novel ‘Colombo Streets’ and browsed through it while at a bookshop and found nothing remotely readable in that book. It was definitely shallow and with a very dubious and incompelling story line. What I got from the novel was some girl obsessed with getting famous going on about cancer. I find it hard to believe that the Sri Lankan youth is so untalented that this book was regarded the best of the lot.